Featuring electric chain hoists from all high quality leading industrial brands on todays market such as Yale, Stahl, GIS, Lodestar, Lodeguard, Donati, Demag, Tractel and Kito. Supplying all types of motorised chain hoists for standard applications and bespoke applications such as specially designed wind turbine hoists and ultra low headroom hoists providing maximum hook path. With capacities up to 45 Tonnes (45,000kg), heights of lift up to 120m Crane Handling are sure to provide a hoist to suit your requirements. 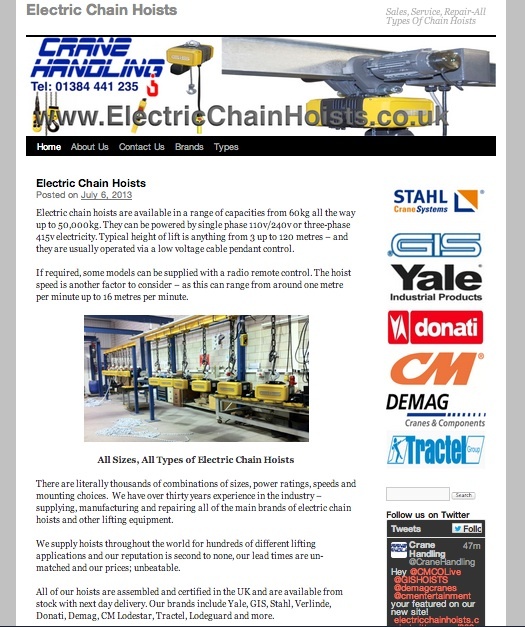 Crane Handling, owners of ElectricChainHoists.co.uk have over 30 years of full experience in the mechanical handling and Lifting Equipment industry, their solutions are designed with simplicity and cost in mind. This entry was posted in Uncategorized and tagged beam hoist, chain hoist, chain motor, crane, crane handling, electric chain hoist, electric lift, electric winch, experts, Gantry Crane, hoist, lifting, lifting equipment, riggers, rigging, winch. Bookmark the permalink.